The e-commerce auction script is one of the hottest businesses on the internet in the current market place. After the rise of online business concept, many people would like to buy and sell new and used products via e-commerce websites. This penny auction software provides a common place where the bidders and auctioneers can buy and sell any kind of products. 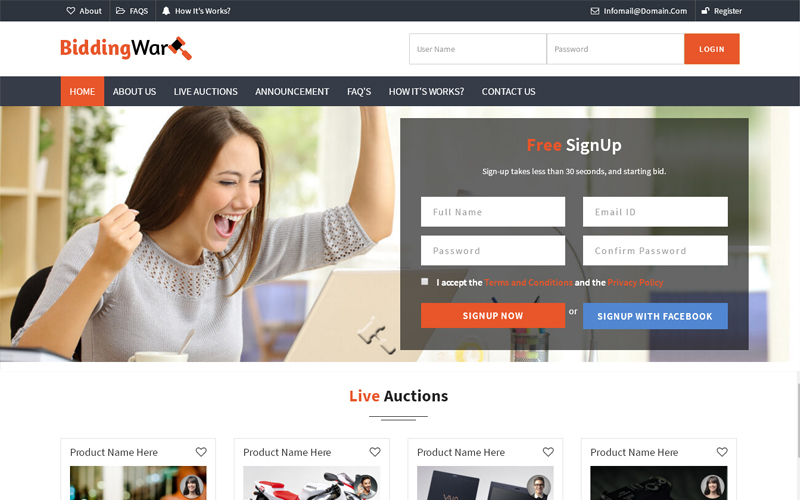 In this auction php script, the users and buyers can bid for the products that are posted by the sellers. The product can be acquired by either the “Bid” option or “BuyNow” option. If the users click “BuyNow” then the product is added to the cart and goes to the checkout. Once the bidding time exceeds, the product does to the highest bidder. There are three different logins in this reverse auction script; the user or bidder login, seller and the admin, with the maximum rights to the admin panel. The admin has some powerful features like banner ads management, user management, set commission rates for the sellers. The website has multiple features such as multi-vendor commissions that can be controlled by admin, detailed report for the vendor and the administrator, high speed loading, secure codes and PayPal gateway integration. We have put in great effort in developing this e-commerce auction script, so you don’t have to waste time and money to develop a website from the scratch. Once the payment is done, the site will be up and live within 24 hours. It is a onetime investment with lifetime revenue. We know that getting your website to the users is necessary; hence we have made our script to be SEO-friendly by optimizing it with Google standards which makes your site come on top of the search results, thereby increasing your sites ranking and visits from the search engines directly. We also provide you with 1 year of technical support and 6 months of free upgrades for the source code. Happily I bought this e-Commerce script for my business. It contains bunch of categories to enter. Satisfied and fulfilled with this script. Fantastic script from your side that helps me a lot to run my market through this e-Commerce script. Timing help and update info from the support team. Thanks for it. Just a quick one for accessibility, visibility and UI is very friendly to move.